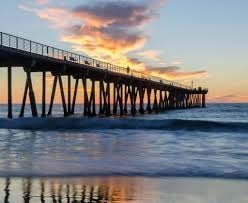 Featured as one of the "Top 10 Beaches" on the Travel Channel, Hermosa Beach is the little gem by the sea with something for everyone where the surf, sand and palms welcome visitors and residents year-round. This intimate sun-drenched beachside village combines a spectacular coastline, wide sandy beach, a century-old rich history, specialty shops and restaurants and lively festivals - long a favorite with Californians. Hermosa Beach covers 1.43 square miles and is located 4 miles south of Los Angeles International Airport (LAX), bounded by the Pacific Ocean on the west. Hermosa Beach, California, gets 13 inches of rain per year. The US average is 39. Snowfall is 0 inches. The average US city gets 26 inches of snow per year. The number of days with any measurable precipitation is 21. On average, there are 283 sunny days per year in Hermosa Beach, California. The July high is around 72 degrees. The January low is 50. Hermosa Beach City School District consists of 2 schools: Hermosa View School (Transitional Kindergarten thru 3rd grade) & Hermosa Valley School (4th thru 8th grade). Serviced by two out-of-city high schools (Redondo Beach and Manhattan Beach). 1 Catholic elementary and high school. **Websites referenced for provided information: www.hermosabch.org, www.hbchamber.net, www.hbcsd.org, en.wikipedia.org, www.bestplaces.net.